"A Place for the living and the dead"
Our vision is to create a model that can be replicated throughout the world. A CONSERVATION CEMETERY utilizing holistic, regenerative and spiritually inclusive practices in caring for the dead and the earth. Food bearing trees, tropical hardwoods, native trees and plants will be planted over graves. A PARK, interspersed with the cemetery, that includes walking trails, picnic areas, reflecting ponds, labyrinths, open space and greenways. Interweaving life and death. A SCHOOL FOR CONSCIOUS LIVING AND DYING providing trainings, skills, tools and programs for many aspects of wholehearted and sacred living and dying and the care of the dying and the dead.This will include an‘in-house’ staff of teachers and leaders as well as special guest presenters. A GUEST HOUSE FOR THE DYING, supported by local hospices and staffed by volunteer interns trained at our school. This is for people in their last weeks of life who recognize the importance of their dying time as a powerful opportunity for deep inner work, life completion and transformation. 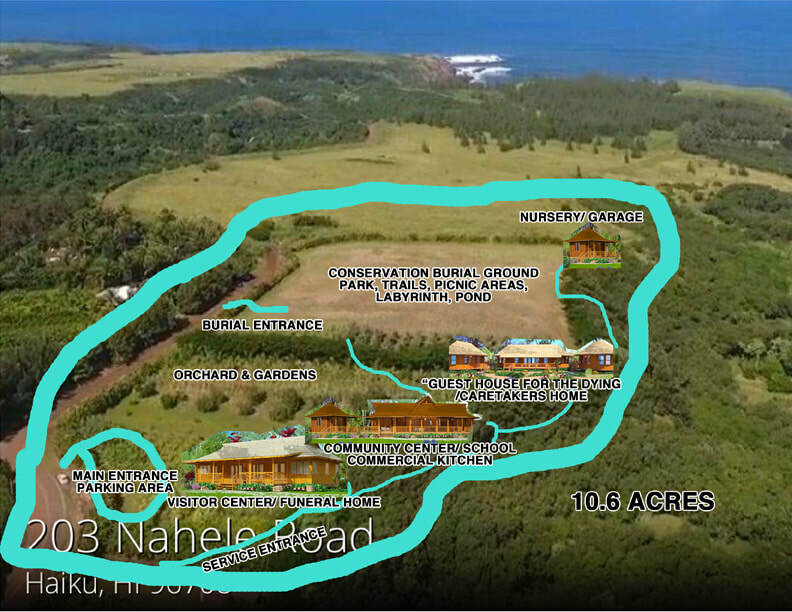 DEMONSTRATION PROJECTS focusing on regenerative, agriculture, sustainable energy creation, bamboo and hemp as building materials, and on. A PLANT AND TREE NURSERY to support the cemetery plantings as well as an income generator. A VISITOR HUB and information resource center. A CO-HOUSING FACILITY for the small residential staff. A TINY FOOTPRINT This center will be built, as much as possible, with local, sustainable materials, powered by the sun, etc. Income generators include burials, cremations, school trainings and programs, fees for use of ceremony hall, fees for residents of the home for the dying, visitor merchandise, plant and tree starts, grants and donations, endowment funds, and on. Attached to this center, or a part of this center is an assisted living facility supported by local support agencies and our trained interns working towards completing our certification training. "DYING TO GO TO HAWAII" Creating Maui as a destination for the dying and their families. In giving away the caring for our dying and dead to institutions and businesses, we have cut ourselves off from important soul work and community building work. Not engaging directly in this work as a community is a contributing cause of a people and a culture that is out-of-balance. Death and dying are rarely a part of our cultural conversation. An unwholesome relationship with death has led to an unhealthy relationship with life and the life of the world we live in. Through the collective understandings, experiences and expertise of the founders of Doorway Into Light, a new model has emerged, one that leads to a very different way of living and dying and one which is respectful of everyone’s spiritual views. This model has its roots in religious and indigenous traditions. It honors and integrates well with some existing organizations and at the same time brings a powerful new paradigm to the sacred passage of dying and death. In this paradigm, communities take more of a “hands-on” approach; from physical, emotional and spiritual care, to bringing forth new rituals and ceremonies that lend support to the natural grieving process and the journey of the departing soul, thereby enriching family and community life. This model further supports healthy communities in right relationship with the earth, through sustainable, organic and renewable practices. It is now time to take the next step in manifesting its larger vision here on Maui.